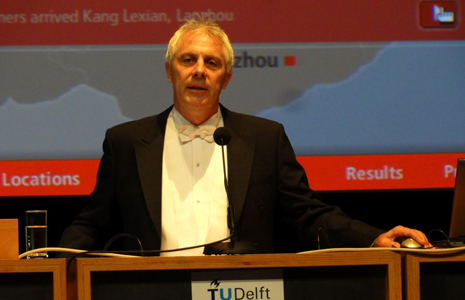 Associate Professor Roger Ball successfully defended his Doctoral thesis “SizeChina – A 3D Anthropometric Survey of the Chinese Head” at TUDelft in the Netherlands on May 17 2011. His doctoral manuscript examines head shape differences between Western and Chinese populations. The main research questions are; What is the 3D shape of the Chinese head? What are the differences between Chinese and Western head shapes? and What tools do designers need to create China-fit products for the head and face? The examination committee from TUDelft included; Dean of Design Dr. Cees de Bont, Prof. Daan van Eijk, Dr. J. Molenbroek, Prof. B. Ninaber, and Prof. E. Jansen. External examiners included; Dean of School of Design Hong Kong Polytechnic University Dr. Lorraine Justice, Prof. Dr. G. Kleinrensink, Erasmus University and Prof. Dr. Hein Dannen, Vrije University.